“It was just wonderful, a real joy." Two fusion guitar legends discuss their new live album with GW. 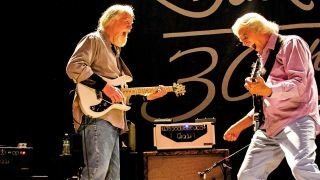 John McLaughlin & Jimmy Herring Premiere "Eternity's Breath"
15 of the greatest six-string talents in prog through the years. John McLaughlin,one of music’s most influential and prolific guitarists, composers and bandleaders, will begin hisfarewell U.S. tourNovember 1, 2017, in Buffalo, New York. Welcome to our first-ever Greatest Guitarist poll, where 128 guitarists go head to head, round by round, in a bracketed format, all to crown your choice for the Greatest Guitarist of All Time.